Thumbing through Parade Magazine today I couldn’t help but read the feature on Disneyland. In July the park will turn 60 years old and the magazine pointed out a few interesting facts about its very successful run. Reading about it brought up a semi-serious debate I have with Sidney from time to time. Sidney will tell you that she has visited Disney World around 8 times. I have visited Disney World twice. I have also visited Disneyland. We will go back and forth on which park is better. It gets pretty serious. Maybe it is my west coast bias, but I think Disneyland is better. Although I made that trip with my family when I was in fourth grade, I remember it very fondly. In fact, it goes down in the Reser history books as the best family vacation we ever went on. In the past five years, I have made the trip to Orlando twice. Both times I stayed at a Disney resort property and of course visited Disney World. Perhaps it was my old age, but I just didn’t think it was all that great. A little more on this in just a little bit. Sidney uses her veteran Disney World status as reason on why that park trumps Disneyland. She has had numerous fabulous experiences going as a young girl with her family and then with her young niece as well. To her, there isn’t a better place on the planet so it must top the similar park in California. She also uses arguments that I can’t deny…Disney World is newer and bigger. But in my opinion, newer and bigger isn’t always better. Disneyland is more intimate. In comparing my experiences in both parks, it just felt like Walt Disney’s spirit was hovering around me closer in Anaheim than it was in Orlando. Disneyland is just more magical, more historical, and more original. You can’t deny the originality aspect, Disney World is an east coast replica of the place that was built 16 years before it. I think Disneyland wins on the intangibles as well. The consistent and pleasant sunny conditions that characterize life in southern California contrast with the unpredictable and stormy weather that plagues Orlando. While Disney World definitely receives many gorgeous days, it also is prone to nasty days as well. Trust me, I know. Yes, I already alluded to it but Disneyland will also always come first. It was the prototype and Disney World will simply never catch up to Disneyland in terms of nostalgia and pop culture references. Finally, Walt Disney practically built Disneyland with his own hands. He was five years dead before the Florida park opened. Okay, there you have it. Once again I give you a heavy dose of my opinion. If I ever win a professional sports championship and they shove the microphone in my face I am telling them that I am going to Disneyland. Now it is your turn. What park do you feel is superior…Disneyland or Disney World? I am curious to know. Don’t Blink. I must admit that this Thursday Rundown feels a little different. It will be the first time in eight weeks that I don’t include a Sean Carty update. Thank goodness though! The district spoke, Coach Carty was reinstated, and parents were silenced. As Mead High School moves on, so will I. Here we go with the rundown! 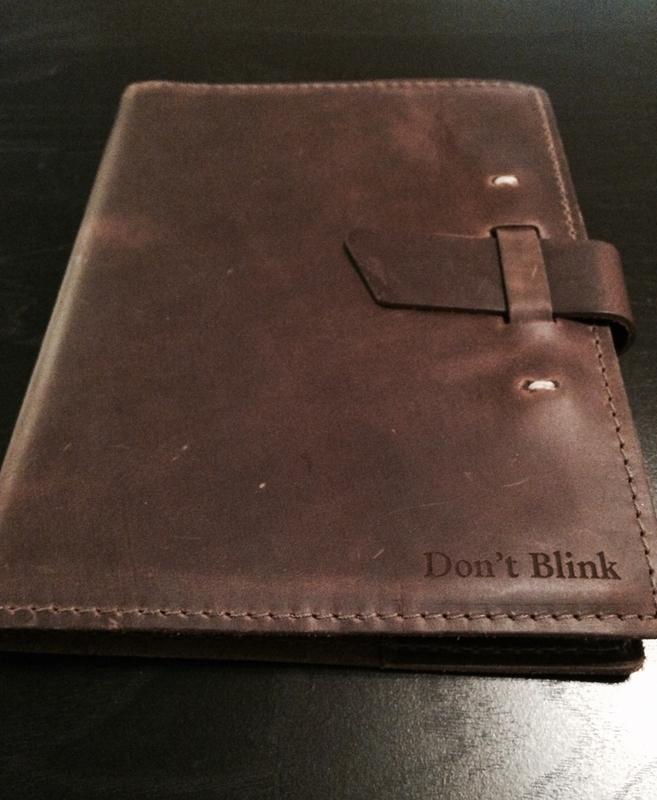 End of a (Journal) Chapter – Last night I filled out the last page in my latest journal. Many of you are aware that I am an obsessive journaler with an in-depth recorded entry of every day I have lived since the seventh grade. As a typical journal usually takes me about a year and a half to two years to completely fill out, closing one up is always bittersweet. I take the task of choosing my succeeding journal very seriously. This time around, I have an attractive option. Sidney gave me a custom made leather bound journal with my life motto on it. If I choose to go with it for my daily purposes I will have a very well-branded spot for my personal reflections. The new journal that Sid gave to me. Don’t Blink. Happy National Burger Day – Even though I dislike gimmick dates, National Burger Day is just too hard to pass up. I want to recognize the best burger places in the cities I have lived. For Myrtle Beach it is not even a contest, River City Café is amazing! Besides the peanut butter burger they serve, I have tried other selections as well and the quality and taste is unmatched. For Missoula I would go with the Burger Shack, a hole-in-the-wall place that unfortunately didn’t last long. Because it is out of business, I will give my current nod to the very popular “Mo Burger” at the Missoula Club. When it comes to Spokane, I got to go with a casual dining restaurant called Prospector’s in North Spokane. Of course, nothing beats a burger off my dad’s grill! 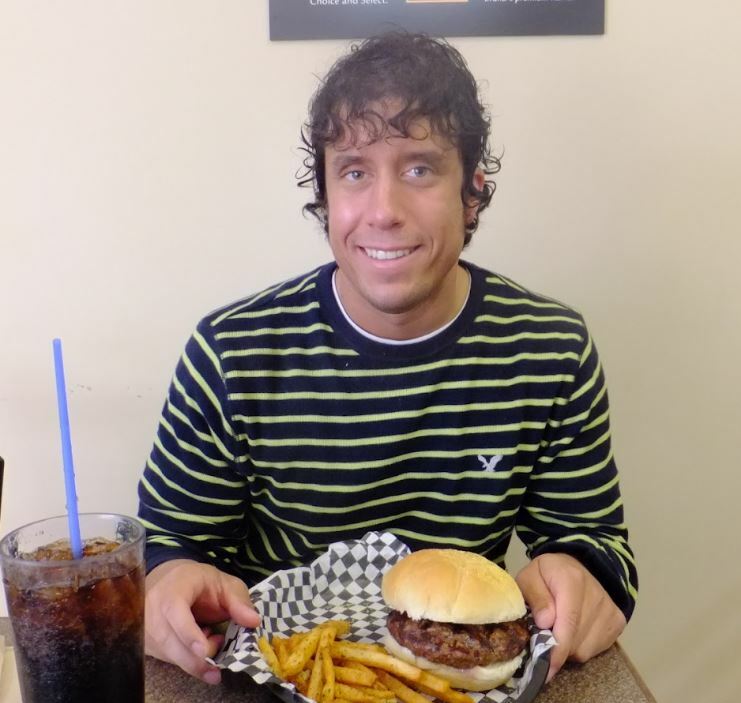 Me enjoying a burger at Burger Shack in 2012. Go Home, Electronic Cigarettes – What is a Thursday Rundown without a rant? I just want to put on record how much I despise electronic cigarettes. Why aren’t these things banned just like all other smoking products? While I know users blow out “vapor” instead of “smoke” please give me a break. I don’t care if it is vapor or smoke, I don’t want it blown by me while I am in a restaurant, at the pool, or waiting in line somewhere. Folks casually pull them out in public as if it was their iPhone. I could definitely do without. NBA Finals – It took me all but two seconds to have an opinion on how I want the 2015 NBA Finals to go down. Simply, I hope Golden State demolishes Cleveland. I am crossing my fingers for a 4-0 sweep. I don’t even want to bring up Lebron, I just want the Warriors to do some damage. The sooner Steve Kerr and Stephen Curry are hoisting the trophy, the better. End of May – When I reflected on April I explained that allergies bothered me for most of the month. I mentioned how nice it would be that right when May hit, my system would automatically clear up. You know what?? It did! I felt like a million bucks the whole month and besides just feeling great the month went great as well. But to be honest, I can’t wait for June. Traditionally, June is right up there with March for me when it comes to the 30 day blocks on the calendar that always seem to produce plenty of fun and big moments for me. I have a good feeling that June 2015 is going to be special. 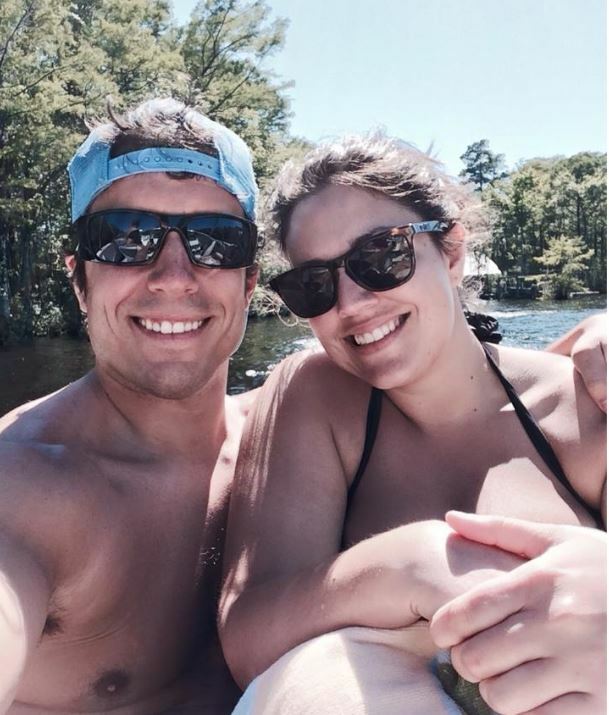 Enjoying some boating time on the Intracoastal Waterway with Sid during Memorial Day weekend was a highlight of May for me. Enjoy a big juicy hamburger tonight, okay? Thanks again for your readership and enjoy the weekend. Don’t Blink. Several months ago on Facebook you could play along with an interactive map and count all the states you had visited. For some of the garbage that goes through the newsfeed, I actually thought this offering was pretty cool. I completed it myself but then forgot about it. Today someone randomly mentioned the state of Maine. Since I haven’t had the pleasure of visiting the state, it got me thinking once again about that map I completed on Facebook. Wanting a quick topic to write about tonight, I thought I would recognize the three states I would like to visit that I haven’t yet. Then, for good measure, I thought it might be good to write a quick sentence detailing my fondest memory from each state that I have visited throughout my time living in this nation. 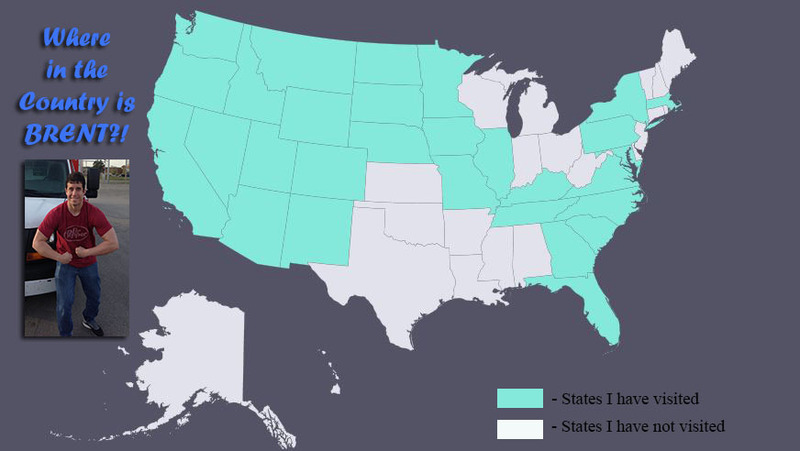 This is my personal map of states I have and have not visited. Hawaii – Absolute no-brainer. I would love to go to this tropical island and do all the tourist offerings. I would be so excited to interact with the local people and check out the blue water. Texas – Out of all the states I have not been to, this one surprises me the most. I would have thought that by now work or leisure would had pulled me in that direction. Texas is a hotbed for both professional, college, and high school sports. I also know the state has some great food and I am intrigued by the “Everything is bigger in Texas” mantra. I just really have a desire to get inside state borders and feel that proud attitude. Louisiana – My main desire for visiting Louisiana is to visit New Orleans. I want to visit that city so bad. It is just so colorful and historic that I don’t think I can resist for much longer. Of course I would love to get a taste of the Mardi Gras celebration. Arizona – Family vacation to visit my uncle and watch Washington State football in Sun Devil Stadium. California – Going to Disneyland or watching three baseball games in Dodger Stadium with my brother. Colorado – Spending time in Greeley with co-workers and friends while working for Grizzly Athletics. Florida – Twice traveling with Monte to Orlando to compete in the Mascot National Championships. Georgia – Visiting the Coca-Cola Museum or celebrating one-year anniversary with Sidney in Savannah. Illinois – Stretching my legs at a random rest stop. Iowa – Gambling at a casino in Council Bluffs (my least favorite state). Kentucky – Eating a big steak dinner in the very Southern and small town of Paducah. Maryland – Visiting Camden Yards for a couple baseball games with Sidney. Massachusetts – Exploring Boston and witnessing the pride of the city just a week after the Marathon bombings. Minnesota – Sipping on drinks at random airport bars over the course of probably 67 different layovers in Minneapolis. Missouri – Eating at Lee’s Famous Chicken in Columbia (Yes, Missouri has a Columbia just like South Carolina does). Montana – Going to college at the University of Montana in Missoula. Nebraska – Attending the 2015 NCAA Tournament with the Coastal Carolina men’s basketball team in Omaha. Nevada – Vegas Baby!! (about 10 different times). New Mexico – Attending the 2012 NCAA Tournament with the Montana men’s basketball team in Albuquerque. New York – Dream sports vacation with my dad and brother in NYC. North Carolina – Going on a “Bar Rescue” tour with Sidney or touring the college town of Boone. North Dakota – Paying over $1,000 in cash with Jimmy Gibson for Powerade while at the Alerus Center in Grand Forks. Oregon – Vacations to the Oregon Coast with my family. Pennsylvania – Visiting my high school friend Erik in Pittsburgh and exploring the city. 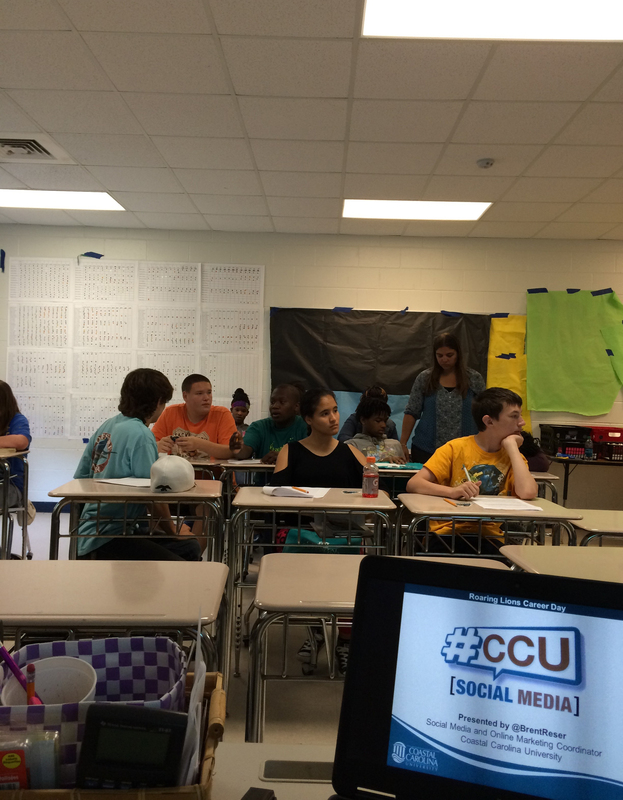 South Carolina – Working at Coastal Carolina University and meeting Sidney. South Dakota – Spending the night in Spearfish with my dad. Tennessee – Eating at an incredible BBQ place in Johnson City. Utah – Road tripping it to Ogden and spending the weekend in warm temperatures in November. Virginia – Visiting Arlington National Cemetery. Washington – Being born and growing up. Washington D.C. – Visiting all the historic sites and monuments. Wyoming – Driving across the state’s hilly terrain. Sorry if my memories bored you just a little bit. I literally jotted down what I remember most fondly about my time in each state, not the craziest story. Of course a goal of mine is to visit all the states but I got some work to do. For a little bonus information, I think my top three states that I have visited/lived in would be (in no particular order) Nevada, North Carolina, and Washington. Where will I visit next? You are probably wishing it is nowhere close to where you live. Don’t Blink. Probably once every couple of months I channel my invention inner-self. I think up some harebrained idea that is either completely ridiculous or so good that it has already been invented. Safe to say, it is quite obvious why I don’t do this for a living. But tonight I have an idea that might actually have some potential. In February wrote about my idea for an ice cream buffet. Just today someone submitted a comment underneath it. Although I can’t understand one word of it I am going to say it was positive. My latest scheme is to enter the facial tissue business and provide companies with branding opportunities for the box design. For example, If Coca-Cola wanted to work with me I would create them a beautiful red box with the company’s logo front and center with little Coke bottles running around it. Have you ever heard of such a thing? I didn’t think so. This idea has been brewing in my mind for a while now. I admit, when I go to the grocery store I scrutinize what Kleenex box design I want to buy. I debate whether to pick up the red box with a floral pattern on it or the blue box with fluffy clouds. Although this sounds like a direct shot at my manhood, I can’t lie. I don’t even make the decision based on matching purposes for my apartment, I just do it on account of what design I think I will elevate my mood the most. 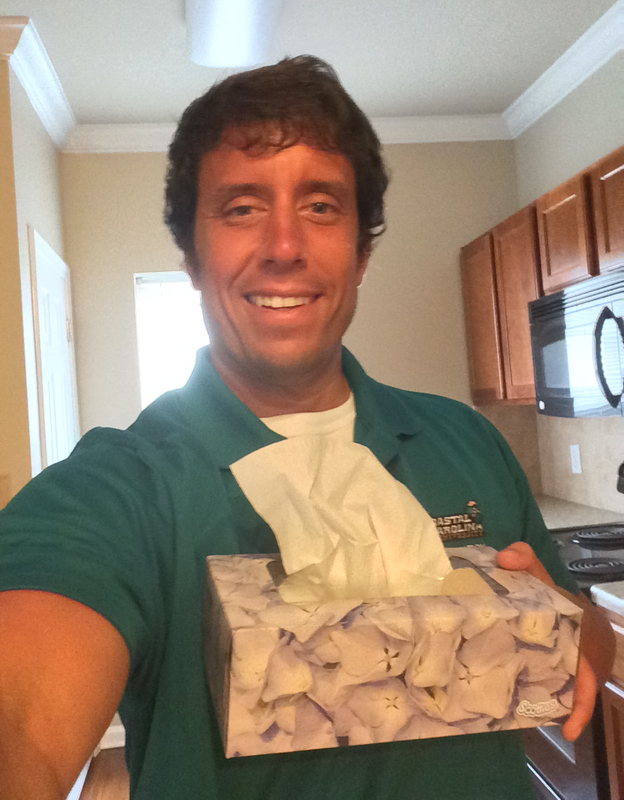 Me with the current tissue box I have in my apartment. But the options are slim. The designs all revolve around light, peaceful themes. My idea is to offer tissue boxes that are bold, attention-grabbing, and hashtag-covered. The direction I would take my idea is to create the cheapest tissue product on the market. I would then make offers to companies to produce branded boxes that I would guarantee to get on store shelves. I would hit up fast food chains, automobile manufacturers, beer companies, and celebrities to invest in their own facial tissue box. Heck, I would even hit up professional and college sports teams. Could you imagine going to the tissue aisle and seeing 50 different mundane designs? But then you look to the side and notice a sleek looking Seattle Seahawks box the neon blue and neon green mixed in with the distinctive logo! Even if you aren’t a Seahawk fan you would still probably get it just because it stands out and is something totally different from what you usually see. Of course the possibilities are endless as the option might even be available to get the tissues themselves in team colors. How flipping cool would that be? Just going through my head right now I am visualizing a Taco Bell box, a Cheetos box, a David Letterman box, a Blue Moon box, and a Coastal Carolina University all-teal box! On these cardboard vessels of Kleenex you could put social media handles, brand slogans, and calls-to-action. Things could get a little out of control but it would certainly liven up the facial tissue aisle. So I now turn over my idea to you. What do you think? Brilliant? Feasible? Has potential? Just another terrible idea? Let me know what you think and please pass that Kleenex. Don’t Blink. Last week I read a very interesting blog post that ruffled a lot of feathers. Some dude named Christian Thibaudeau sounded off on his disdain for the influx of women entering into body building/figure competitions. He basically said people are doing it for all the wrong reasons, namely for attention. He made no attempts to hide his hatred for selfies, Instagram posts, and Facebook albums that new competitors use to chronicle their transformation. To read his passionate post, click here. I agree with Thibaudeau on this: the explosion of ordinary women competing in body competitions is very real. My social media feeds are many times completely dominated with girls I know posting photos showcasing their training regimen, pre/post workout faces, before and after body comparisons, competition action, and trophies. To me, it almost seems like the majority of my female friends are taking part in these fitness endeavors. But do I have a problem with it? Absolutely not. Even if the goal of each girl actually was to garner attention, I still really wouldn’t mind it just because the work needed to receive that attention was noble. If the sole reason someone got really fit was just to receive 1,000 likes on an Instagram image, the fact of the matter is that she still got really fit. She overhauled her body, why hate? Of course most females don’t do competitions to win praise from others. They do it because they want to challenge themselves, make a positive change, and set goals. Also, it is a legitimate hobby these days. It seems to me that I see just about as many girls enter fitness competitions as I do see them go watch “Pitch Perfect 2” or make a craft they saw off of Pinterest. It is a trendy thing to do but it is a positive thing to do. I might not prefer the body competition look that so many women have attained but I sure as heck respect it. I also respect Thibaudeau’s right to his opinion but I really do question his motives. As a fitness nut himself, you would think that he would support more people entering his growing industry. Perhaps he just wanted to stir the pot a little bit? I admire my friends who set a goal, start a program, and transform their bodies. There is absolutely no way I can discount the amount of hard work it takes to pull off such a feat. To all my fitness competitor friends…don’t let Christian get under your skin. Don’t Blink. It just usually doesn’t turn out this way. Many times when an organization makes a personnel decision, especially an educational body, the decision stands. Although a full line of appeals await, many times it is fruitless. Even in this recent Mead High School case where the verdict was so flawed and so knee-jerk, the powers that be usually don’t budge. In fact, in my initial blog post addressing the non-renewal of the head football coach’s contract, I likened the chances of a reversal to the completion of a Hail Mary. I guess I didn’t give full consideration to the fact that they were dealing with Sean Carty. When I received word last night that the Mead School District had struck down the principal’s decision and reinstated Carty to his head coach position, I was elated. I typed out an all-caps text message laced with question marks and exclamation points and sent it to the man himself. Carty responded in the best way possible. Could this have been more perfect? I want to take Carty’s lead and not dwell on the parents. Rather, I would much rather focus on Coach Carty’s resiliency. Or I would much rather focus on the humility of the Mead School District to correct the mistake of one of its administrators. Or I would much rather focus on the savvy and intelligence of the three men who helped represent Carty through the appeals process…Don Beloved, Paul Kautzman, and David Whitehead. Or I would much rather focus on the patience of the assistant coaches who also battled through this storm without contracts. Or I would much rather focus on the strength of Carty’s wife and two daughters who had to witness the injustice. I would also like to express my gratitude to the community as well. I was so impressed with all the people who contacted me wanting to do anything they could to help out. Some of these people I had not talked to in years, most I had never talked to in my life. Coach Carty stood up for what was right and fought this. But the collaborative effort of the community gave him that extra boost he needed. Social media is extremely powerful. The sun shined down a little brighter off the blue track that circles the football field at Mead High School this morning. Those same rays also radiated off the big gold rock that greets each player before practice. Thankfully, the school will now have to wait a little longer until they name it after Sean Carty. All is right in Panther Land again, the good of high school athletics triumphed over the bad. Don’t Blink. Carty Developments – I definitely have some new information on the Sean Carty appeal process to share with you. Dr. Rockefeller excused himself from hearing Coach Carty’s case because the two men developed a personal relationship over the years. An assistant superintendent stepped in instead. I have been told that the allegations hastily leveled against Carty from a small group of parents have been completely discredited. The ruling body will not even consider the silly complaints lodged by these people. Instead, if the contract non-renewal is upheld, it will be solely on the belief of the district that the Mead football program needs to go in a new direction. Of course many people will probably be upset about this. You see, an investigation was conducted as a result of these allegations. District time and resources went into this examination. In the end, it was all a complete waste. Although this is a major victory for Coach Carty, his football job still hangs in the balance. If the assistant superintendent feels that Carty’s overall winning record, GSL championships, and model way of developing young men is not enough, he will take his case to the final level…the school board. Coach Carty will know his fate very soon, perhaps tonight. If we aren’t celebrating his reinstatement, I will make an edit underneath this paragraph encouraging any supporters to e-mail the school board in a show of support for Sean. Stay tuned. Scroll down to the very end of my blog post to see a very elegant comment left just today that a former blogger on the prep scene left regarding Coach Carty and parents. It is very telling. Letterman Finale – When it comes to show finales, they can be hit or miss. In my opinion, David Letterman hit a grand slam with last night’s final episode of the “Late Show.” I thought his opening monologue set the tone and that his reflection/thank you session was satisfying. However, my two favorite moments came with the top ten list and the ending montage. It was a lot of fun watching the major celebrities walk out one-by-one to reveal the contents of the list. It kept me guessing on who would walk out of the curtain next but mostly I was fixated on what the next item on the list was going to be! Dave going down the line to shake hands with each person before the commercial break was priceless. When the show ended with that collection of photos while the Foo Fighters played “Everlong,” I felt everything came together. Even though each image appeared on screen for about a tenth of a second, every one seemed to register with me. It really explained the significance and scope of the “Late Show.” An icon left the airwaves last night. Residence Hall Reveal – When the academic year comes to a conclusion, strong content for social media can sometimes be hard to find. Not this week. Over the next 14 months, we will have four new residence halls opening up on campus (yes, our university is growing like crazy). We wanted to make a splash introducing these new buildings to the community. Deciding to give each new residence hall its own turn in the sun, I showcased each one on a separate day this week. Making sure to reveal each one in a special way across our main social media outlets, our audience loved learning the names of the new halls and viewing the slick renderings of each building. Tomorrow the #CCUResHallReveal will culminate with a video giving the viewer a hard hat tour of all four structures. 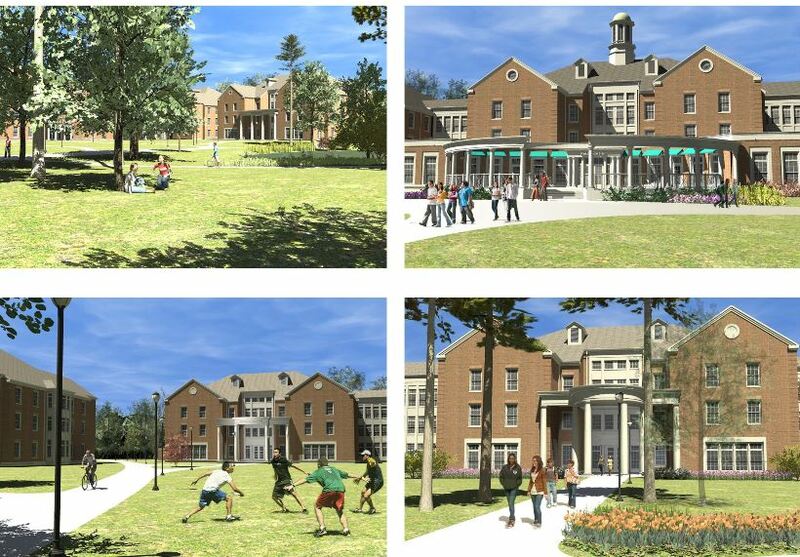 Renderings of all four of our new residence halls. They are named Chanticleer Hall, Tradition Hall, CINO Hall, and Teal Hall. NBA Conference Finals – I am not straddling the fence when it comes to who I want to see come out of their respective conference finals. I am hoping for an Atlanta Hawks vs. Golden State Warriors championship. I just can’t bring myself to cheer for Lebron and the Cavs…no way. When it comes to the Western Conference, I am cheering for a team instead of against one. I really want to see Steve Kerr and Stephen Curry make it to the NBA Finals. Watching the Warriors make it to the grand stage would be refreshing and fun. Once the championship is set, I will be sure to fill you in on who I want to see hoisting the trophy at the end. Bikefest – In Myrtle Beach there is a major event called Bikefest. Thousands of motorcycle enthusiasts converge on our area every Memorial Day weekend. The city becomes swamped and getting around is very difficult. Last year the event was marred by several shootings and deaths. It caused a colossal outrage in the community and the planning to clean up the event pretty much started the Tuesday after Memorial Day. I kid you not, the efforts to make sure this year’s event is not a repeat of 2014 have been chronicled on the front page of our local newspaper pretty much every single day since last May. Law enforcement from all over the state will be aiding our local police officers to make sure the weekend goes off without a hitch. To say Bikefest is a complex issue is an understatement. There is a big racial element that causes a great divide and many misunderstandings between groups. My only hope is that we will have a very harmonious next three days here in Myrtle Beach. Bikers take over Myrtle Beach during Bikefest. (Photo courtesy of the Sun News). On that Bikefest note, have a wonderful Memorial Day weekend. I will keep you updated on the Sean Carty situation. As always, I am very thankful to all my readers for taking the time to read my ramblings. You all are the real MVPs. Don’t Blink. Today I had a pretty awesome opportunity. I represented Coastal Carolina University and I went out to Loris Middle School to take part in the Roaring Lions Career Day. For most of my readers who don’t know, Loris is a tiny town located in South Carolina about 45 minutes away from Myrtle Beach. 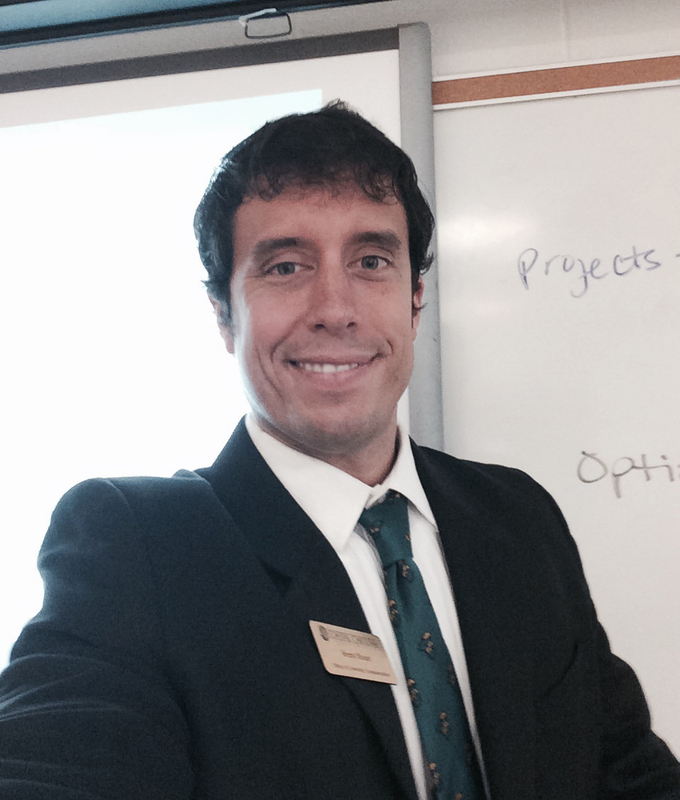 Early this morning I ventured out to the middle school to educate a bunch of eighth graders on what I do for a living. 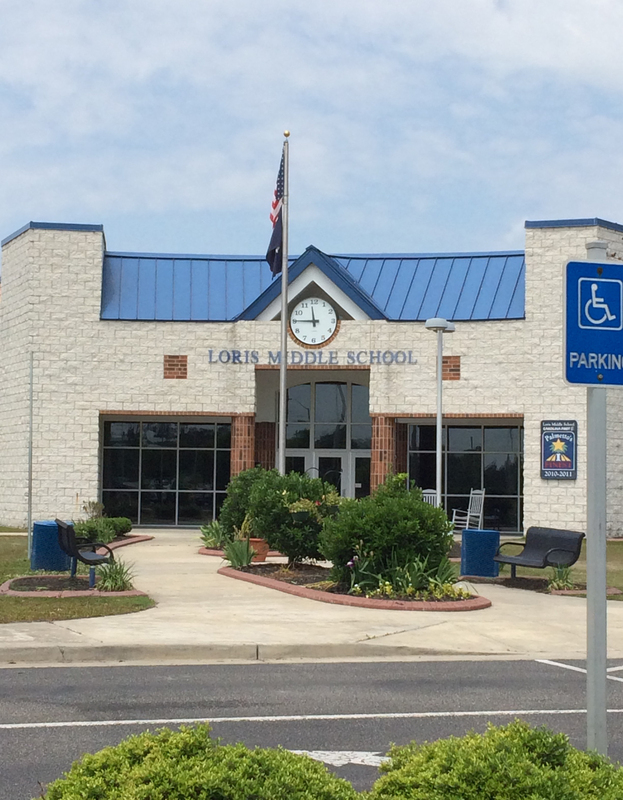 I visited Loris Middle School today. When I worked at the University of Montana I visited a lot of elementary and middle schools because I was in charge of our Griz Student of the Month program. However, it never required me to stand up in front of a classroom for an extended period of time. Tasked today with giving a 40 minute presentation on all facets of my job, I just hoped that I wouldn’t bore the poor kids to death. A couple minutes before it was show time. But in all honesty, I was sent to fight against such a reaction. We thought perhaps the eighth graders would enjoy listening to someone with a career in utilizing fun tools such as Snapchat, Instagram, and Yik Yak. So, with the understanding that I would actually be talking in their language, I thought my presentation had the potential to go over well. Armed with a PowerPoint full of Chauncey photos, plenty of giveaway items, and trivia questions sprinkled throughout my slides, I stood up in front of the classroom and did my thing. Behind my gimmicks and corniness, I tried to stress one major theme to the students: Social media is a legitimate career that is on the rise. I tried to supplement that message with ways in which the students could position themselves for social media jobs in the future if that was the direction they wanted to head. I also went through what I do on a daily basis, objectives that are expected out of me, professionalism/salary/work ethic, and the reasons why I love my job. Except for the two students who slept through my whole presentation, the other 100 eighth graders seemed to be engaged with and interested in what I had to say. The lively Q&A sessions after each of my talks assured me that students are interested in new media careers. Loris Middle School students starting to fill the classroom for my first presentation. With my last sentence, you are probably now aware that I gave more than one presentation. Believe it or not, I gave FOUR of them. Different eighth grade classes circulated throughout my assigned classroom during the morning. Let me say this, I gained a great appreciation for middle school and high school teachers (as I date an elementary teacher, I already have the utmost respect for them). Speaking for 40 minutes is tiring enough but to do it four times in a row is a bit taxing. Sure, you develop your delivery by the fourth time but everything starts running together. I was asking myself during the last two presentations whether I had already told the students certain points or not. After each presentation, at least one or two students stayed behind to either ask me questions in a more private manner or to just shake my hand. I thought that was pretty neat. When the morning ended, all the professionals ate with the Loris staff in the teacher’s lounge. We were treated to fried chicken, green beans, rice and gravy, and peach cobbler. As sixth graders, seventh graders, and eighth graders all had various professional speak to them, about 12 people who “sacrificed” their mornings at work to attend the Roaring Lions Career Day filled the lounge. I sat at a table with a land surveyor, a lawyer, and a high school head football coach. It was a great way to end my day at Loris Middle School. I had a rewarding time participating in today’s career day. Getting out of the office every now and then to speak to young people is a special treat. I hope to do this again in the future while continuing to educate students on the very real and prospering career of social media. Hats off to all the teachers out there who devote everything they have to the young people who are our future. Don’t Blink. Tomorrow night, David Letterman will sign off from the “Late Show.” With over 30 years hosting a late night program and over 20 of those years coming at CBS, most television viewers will find it a little strange once Dave goes off the air. Count me as one of those. I became a David Letterman fan when I bought a publication that contained a collection of his famous Top Ten lists at a book fair in elementary school. I skimmed through the book with a friend and saw that it had the word “damn” and “hell” sprinkled throughout it. By buying it, I felt like a seasoned adult. Through reading the book, I became familiar with the show’s humor and format a few years before I even actually started watching it. Of course, once I actually did get to watch the program I felt like a stud. Staying up late and watching the semi-adult humor made me feel cool. A picture I took outside of the Ed Sullivan Theater during a trip to New York in 2008. I have stayed loyal to Letterman throughout the years. I thought he blew Leno out of the water. With the new age of late night hosts taking over the past few years, I still preferred Dave. I watched him through middle school, high school, and college. There was a stretch during my final year in Montana that I seemed to watch the show a few times a week. I enjoyed his dry, sometimes mean, sense of humor. He could make me laugh out loud. I have a few special memories when it comes to “Late Night with David Letterman.” The first was watching Alex Rodriguez go on the show for the first time. It was the mid-90’s and A-Rod had started to establish himself as a superstar. As he was a hero of mine, it was a big deal to me that he would be on the show. My parents taped the program for me and I viewed it the next day. I watched the interview thinking that Letterman absolutely loved Alex. Little did I know that Dave (just like any other late night host) smiles at all his guests and does all he can to make them look good. An extended memory that I have is watching the show with my dad on Friday nights when I was in middle school. Back in those days, and he might still do it now, Letterman would always use Fridays to open up the CBS Mailbag and answer questions from viewers. He would read a question and then they would play some super corny skit they taped earlier in the day to address the answer. My dad and I loved how dumb these sketches were and also had a mild obsession with the song they would play when the segment would start. 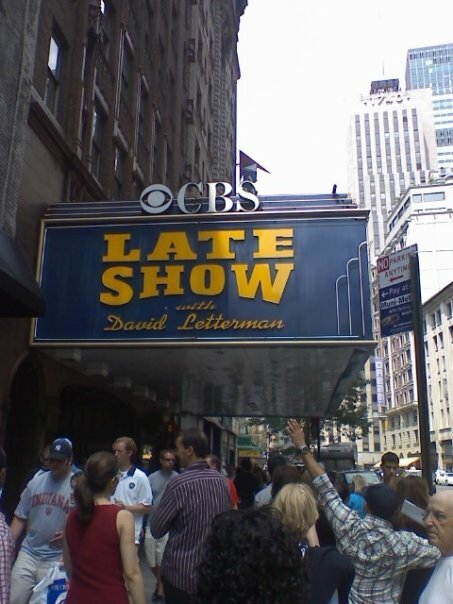 Of course my favorite David Letterman memory was when I actually got to watch a live taping of the show in 2008. My dad, brother, and I took a vacation to watch baseball games in the old Yankees Stadium and Shea Stadium before they both shut down. During the days of the trip, we explored the city. A couple weeks before we left for the Big Apple, I applied for tickets to the Late Show. About a week later I received a telephone call from a Late Night staff member. He told me if I could answer a trivia question correctly I would win two tickets. He asked me to name the show’s announcer and it took me all but one second to respond with Alan Kalter. My brother and I attended the taping. The Ed Sullivan Theater is so much smaller in person than on TV. Dave came out and talked to everyone in the audience before the show started and was a totally cool guy. Once the taping began, despite a couple outtakes, it was smooth sailing. Amanda Peet and John Hamm were the guests. Augustana served as the musical act. It was a neat experience and definitely cemented my fandom for David Letterman. 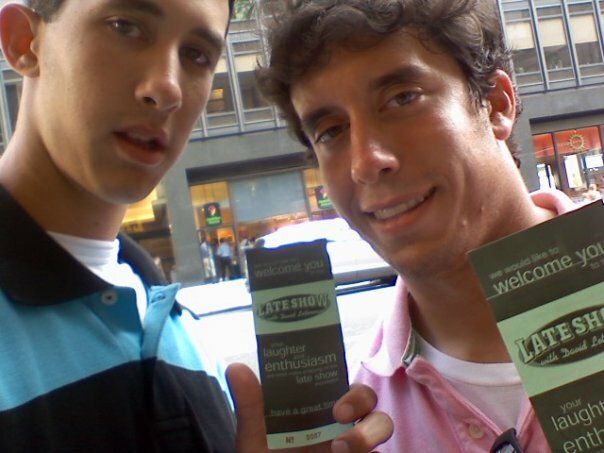 Glen and I with our “Late Show” tickets right before we entered the theater in 2008. I will be watching the final show tomorrow evening. I wish David Letterman, Paul Shaffer, Biff Henderson, Alan Kalter, and the rest of the gang the best. I am thankful for the 15+ years of entertainment that was provided to me. Don’t Blink. Yesterday I learned the tragic news that Peter Underwood, an assistant women’s soccer coach at the Division I level, passed away in a car accident. I had the pleasure of getting to know Peter when we both worked at the University of Montana. I often say that I never got too close to the coaches when working in intercollegiate athletics but Peter and I talked frequently. He had so much appreciation for the work that the athletic department did for the soccer program. A young coach with an elegant English accent and dashing good looks, it was easy to like Coach Underwood. 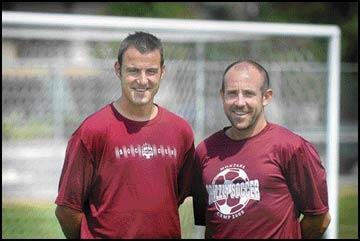 Peter Underwood stands on the left next to fellow assistant coach C.J. Cooper during their Montana days. (Photo is courtesy of Linda Thompson of the Missoulian). On a recruiting trip when the accident happened, Peter’s death leaves behind a wife and two young children. The unnecessary end to his life was caused by a drunk driver going the wrong way on the interstate. 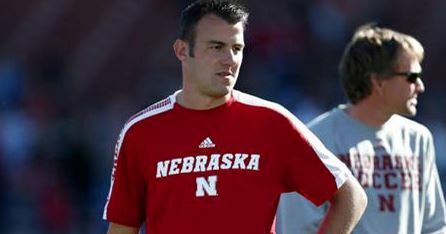 Peter most recently served as an assistant coach at Nebraska. I have a hard time dealing with car accidents. To me, it seems like way too many of them occur. You can just quiz yourself and probably immediately think up five names of people you know who perished while inside automobiles. Then you can probably start thinking about famous people who met their demise behind the wheel and probably come up with at least ten additional names. Car accidents are different from cancer or other extended illnesses for obvious reasons. They happen without warning, the victims are often too young, and the results almost always grisly. The thought of a loved one being taken in this way will make most people shudder in fear. As I have grown older, I have reached a better understanding of why my mom could never rest from the time I left for a road trip to the time I reached my destination. Not until I called my mom and let her know that I made it safely could she exhale. Although statistics minimize the overall chances of getting into a fatal car accident, the potential and threat is always there. Bad weather, a deer in the middle of the road, an in-vehicle distraction, an impaired driver, or a host of other conditions can bring a much-too-soon end to life. Disturbing for many of us is thinking about what car accident victims go through. What went through the poor person’s mind a couple seconds before impact when they knew they were doomed? How excruciating was the pain in the aftermath? What about the fear? These questions are absolutely horrible to contemplate but they really describe why I am so troubled when it comes to car accidents. We can think about what it would be like if it happened to us and get a little scared. But then when we think about it happening to someone who we love very much it not only makes us scared but also sick to our stomachs. We just never know. It was by absolute cruel luck that Peter was driving that Iowa road at 7:05 a.m. this past Saturday. A billion little things could have occurred that would have diverted the disaster. In the end, it is just the nature of car accidents, the ultimate thief of life and potential. This is one of those posts where my beloved phrase Don’t Blink rings even more true than usual. No matter how many precautions we all take when we get behind the wheel of a car or sit in that passenger seat, we are always at risk when on the road. We never know when it will all end. My condolences go out to the Underwood family. Don’t Blink.